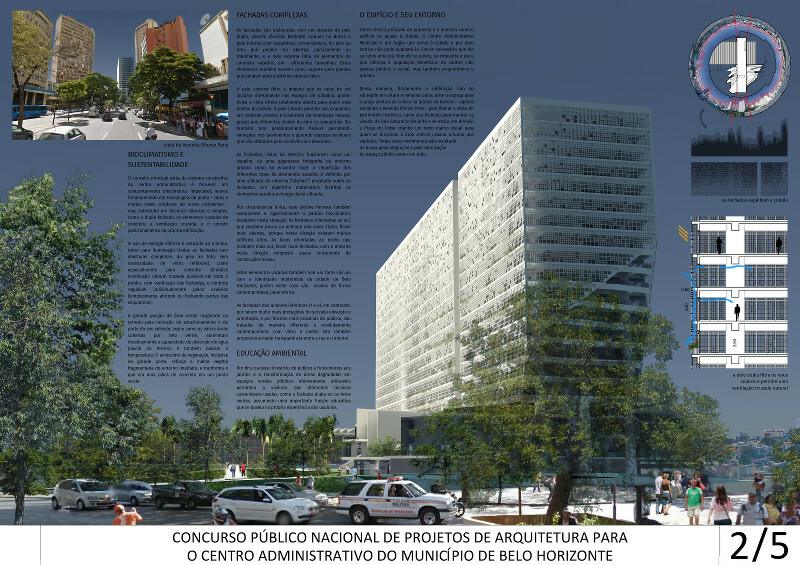 This is a project we did for a competition for the new city hall of Belo Horizonte (Brazil). It didn't win (The link shows the winning entries), but we are pretty happy about the project anyway. The full presentation boards are at the bottom of this article, as well as the blender model. Below is the explication text and some of the images from the boards. 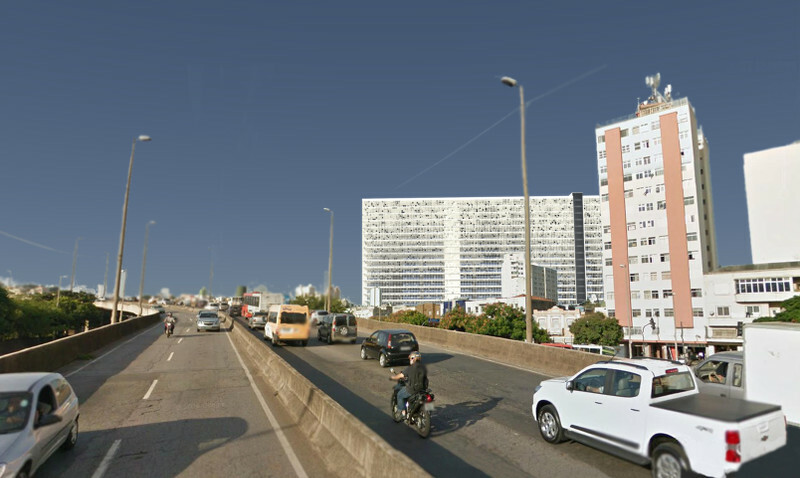 The main idea of this proposal is a project that works like a big hyphen, joining two different urban systems that until now were totally disconnected because of the intense road network that occupies the boundary area: the regular grid of the city centre and the Lagoinha neighbourhood. The connection of these two parts also symbolically reunifies the entire city with its centre. To function as a hyphen, it is necessary for the project to overflow its boundaries. It needs to invade its direct surroundings to "reach" the parts to be reunited. This expansion out of the limits of the terrain, this physical movement made by the project to connect the parts of the city, generates a public space that is multiple and complex. 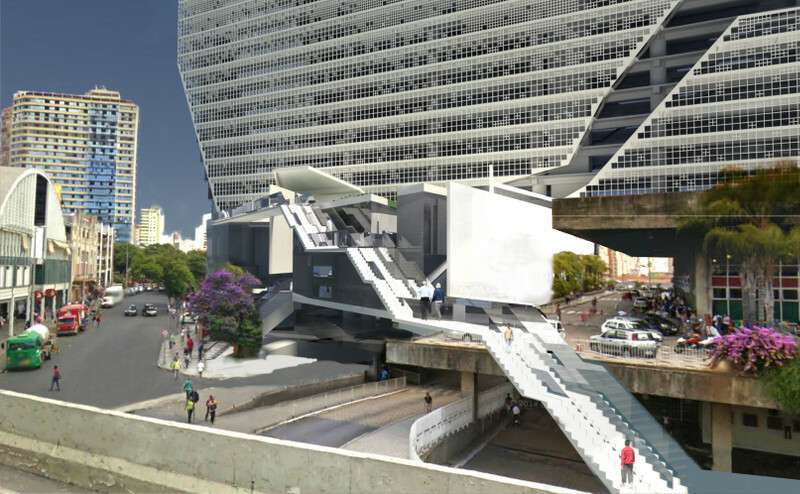 When the building physically encompasses the bus terminal, links to the Praça do Peixe with the footbridge, creates an exhibition space on he boundary, and allows the public to circulate on the gardens created by the project, it brings people to gather on the main square, which also offers access to the metro and the future bus terminal. It is at this confluence of paths, at the intersection between spaces that they also amplify, and create a synergy of different people, and the energy coming from these encounters strengthens these very spaces, and gives them a bigger meaning in the whole city. Or "before anything else, not make things worse", is the first principle of bioethics taught to new physicians, part of the Hippocratic Oath. It is also one of the main concepts of this proposal. The place of the project, in the middle of a high concentration of roads and viaducts, became the centre of a vast area damaged by consecutive operations, each one apparently made with the aim of solving the problem caused by the previous ones. This proposal breaks this vicious circle and sees its surroundings as a fragile but functional situation. Therefore, it does not modify any vehicle circulation, included inside the project area. It only creates multiple, thin pedestrian links with its immediate surroundings, opening breaches that foment small events around the project, and incentives, like acupuncture, the public to deviates from its path and take possession of the space. The main concept behind the constructive system of the administrative centre is to provide an impeccable bioclimatic behaviour, not so much based on high-tech technology, expensive and in many cases origins of new problems, but rather on classical and simple techniques, like double facade, open concrete elements, cross ventilation and the correct positioning of the building itself. The use of electrical energy is reduced to the minimum, as much for lighting (all facades have complete openings, from floor to ceiling, without the need for reflexive glass), as especially for climate control (natural ventilation possible in the whole building, with ventilated facades and local control by the users (by simply opening or closing parts of the window frames). The big portion of green space reclaimed by the removal of the parking space and part of its underground, as the many areas covered with green roofs, raise drastically the rainwater absorption capacity of the plot and also help to lower the temperature. The addition of new vegetation, including big sized, reinforces the fragmented vegetation network of the immediate surroundings, and turns what was a concrete slab into a green space. The facades are built on a double skin system, using techniques that are common in Brazil: the internal skin is made with common framework, from floor to ceiling, and can be partially or totally opened. The external skin is made of hollowed concrete elements of different sizes. 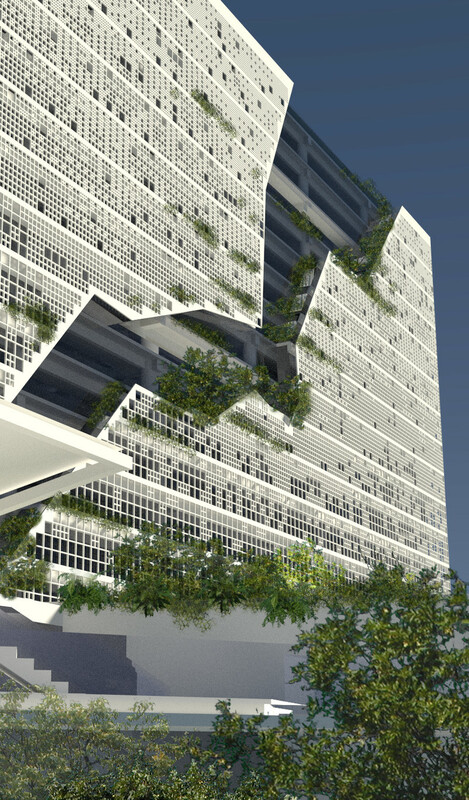 These elements also support vegetation ,that hangs to the outside of the building through them. The external skin filters and prevents sun rays to strike directly inside work spaces, but leaves direct views totally open for who is inside the building. The inner skin gives the users a precise and localised control over natural ventilation, thanks to the different ways to open the windows. It also features a flexible positioning permitting variations on the floor plans, which leaves interesting residual spaces that are used for resting and gathering. The facades, viewed from the outside, works as a mirror, or a gigantic photography of the urban surrounding as it stands today: the placement of the different types of concrete elements is defined by the silhouette of the surroundings (skyline) projected onto the facades. A mathematical algorithm distributes the elements along this silhouette. By unique circumstance, this skyline also provides exactly and rigorously the bioclimatic standard suitable for this situation. 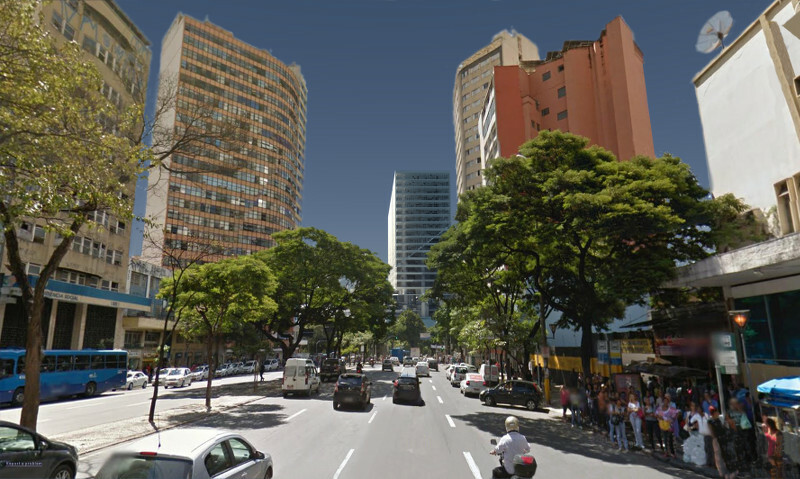 The facades that are oriented to the South, that receive little direct sunlight, are more open, because in that direction are many high buildings. The north faces, that receive more sun, are more open, with the surroundings in that direction composed almost exclusively of small constructions. These hollowed elements also have a strong link with the modernist identity of the city of Belo Horizonte, but in this case they are used in a more contemporary and parametric way. The facades of 1st to 4th floors, in contrast, because they are much better protected from the sun by their elevation and orientation, and also because they are closer to the public, are treated in a very different and resolutely contemporary way, with glass an metal. This also provides more transparency between the street and the interior. Finally, the unrestricted access to the gardens for workers and the general public and the transformation of damaged areas into effectively reusable green spaces allows to personally experiment the different techniques used, like the double skin or the green roofs. This gives the project an important educative function, based on the personal experience of the users. 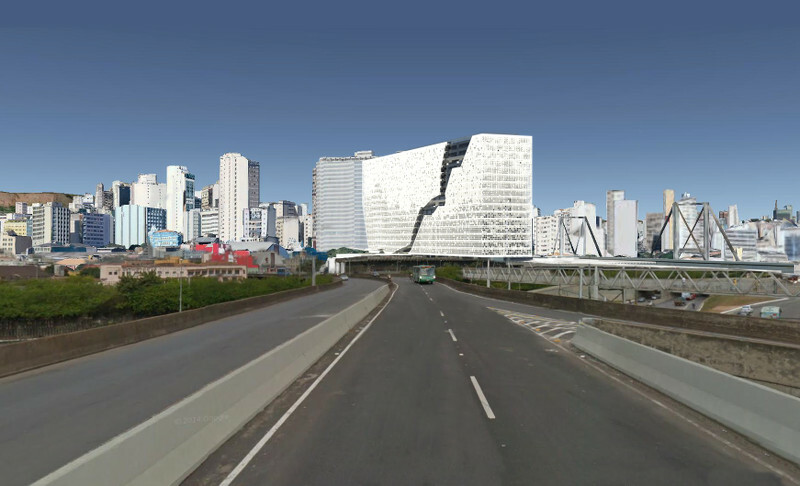 Another main axis of this proposal is the way the building adjusts itself to the city. The new administrative centre is an organ that serves the city, and, because of this, cannot supplant it. 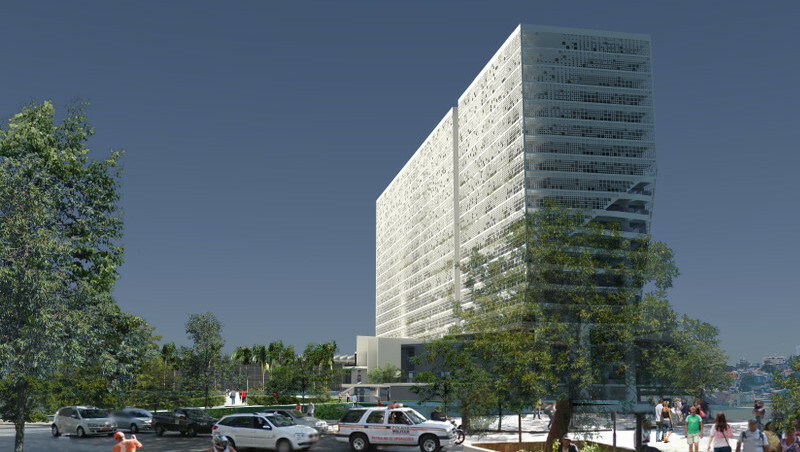 The building must bow to it, be included into the city, so it offers to the populations benefits that are not only social and political, but also architectural and urban. This way, the building does not get higher than any other, opens space for the central square, and pushes itself to one side of the terrain, peering only above Avenida Afonso Pena, to liberate the vision to the neighbouring historical heritage, bends its facade to maintain vision axes from Rua Saturnino de Brito, and stretches in the direction of the Praça do Peixe, creating a new visual mark for who is travelling toward the city centre, coming from the highways. All these movements are the result of the search for integration and magnification of the public space as a whole. The general structure of the building, although simple and classical (a grid of concrete columns and an array of beams that can be of concrete or metallic, and concrete slabs), introduces an obvious difficulty, which is the passing of the columns through the existing building of the bus terminal. This difficulty, however, is mostly compensated by the fact that the new metro line below the terrain already forces the use of very deep foundations. Because of that deepness, the area of influence of these foundations is a lot deeper than the foundations of the bus terminal, which are above the metro tunnel. The columns of the new building have therefore no structural influence on the existing building. Both systems cross each other, each one sitting on its own layer. There are in the world many examples of similar problems solved with success, such as the Hearst Building in New York or the Exchange Building in Vancouver. The drilling of the roof of the bus terminal, to allow the columns to pass through, is a localised, minimal operation, easy to solve technically. 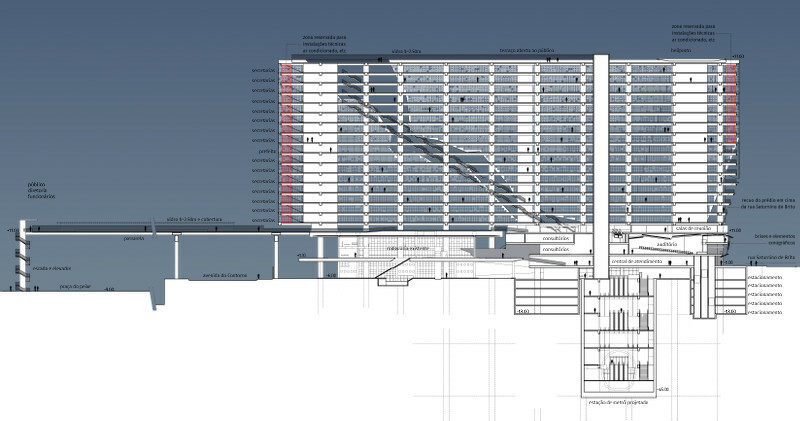 Because of its simplicity, the proposed structural system of this project also has much flexibility. Instead of the 3-columns grid, a 2-columns solution can be studied, and the spacing adapted to the existing foundations, to avoid interference. 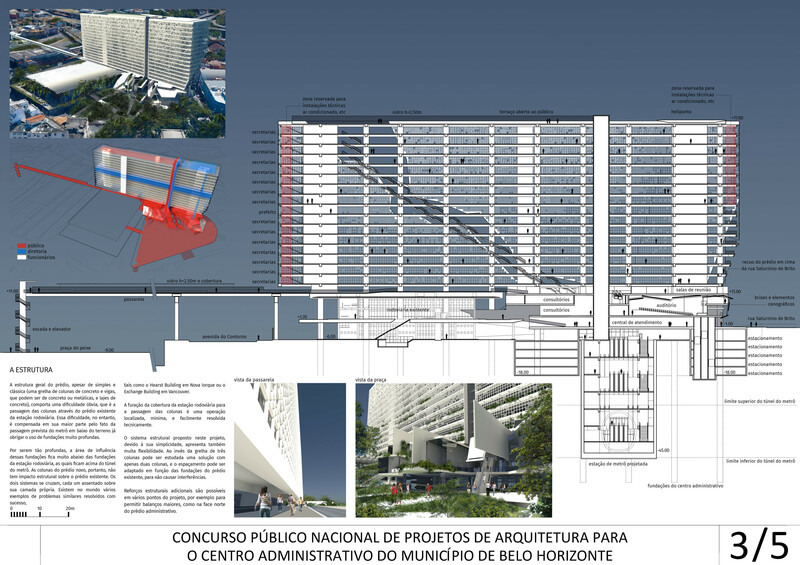 Additional structural reinforcements are possible in different points of the project, for example to allow bigger cantilevers, like at the north extremity of the administrative building. 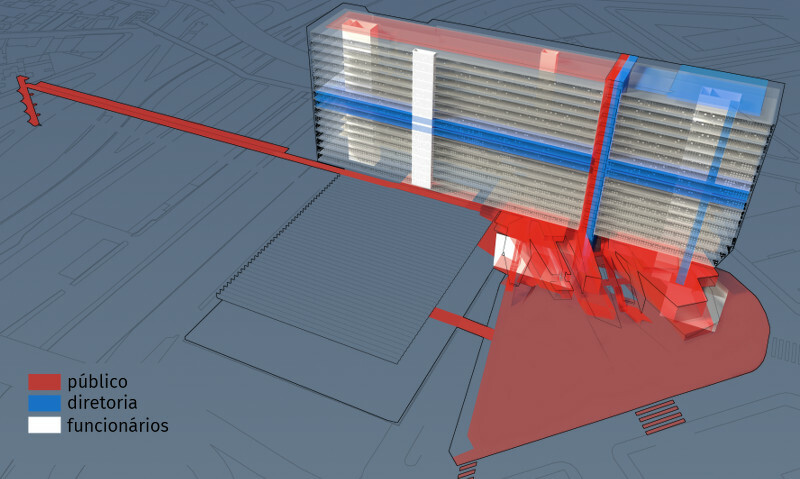 The proposed project and the treatment it gives to the existing building of the bus terminal deviate from the classical and rigid attitudes usually taken when dealing with historical heritage buildings. Those are frequently considered sacred and untouchable, even if this causes them to loose all their life. This project favours a more dynamic integration that incorporates it to a system, and gives it a new life. 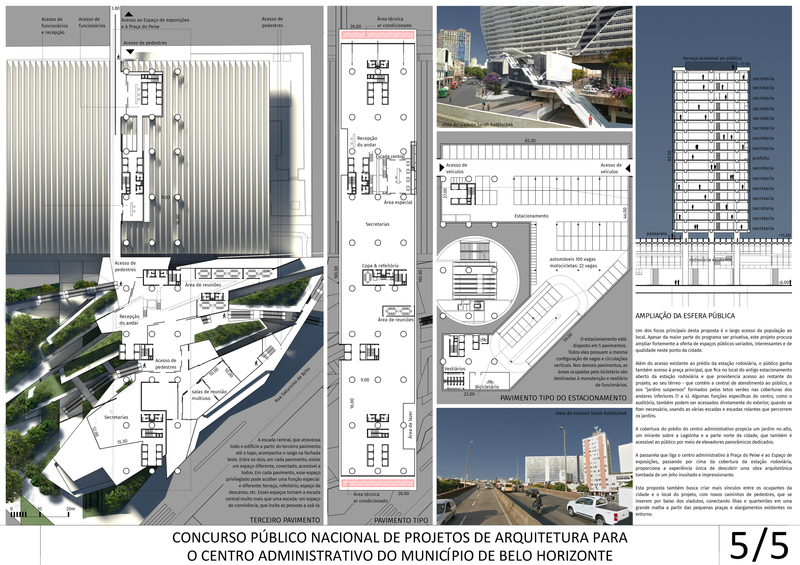 The building of the bus terminal becomes, in this proposal, integrated to a system formed by the administrative centre, by the large public areas, and by the square that takes the place of the old parking space. 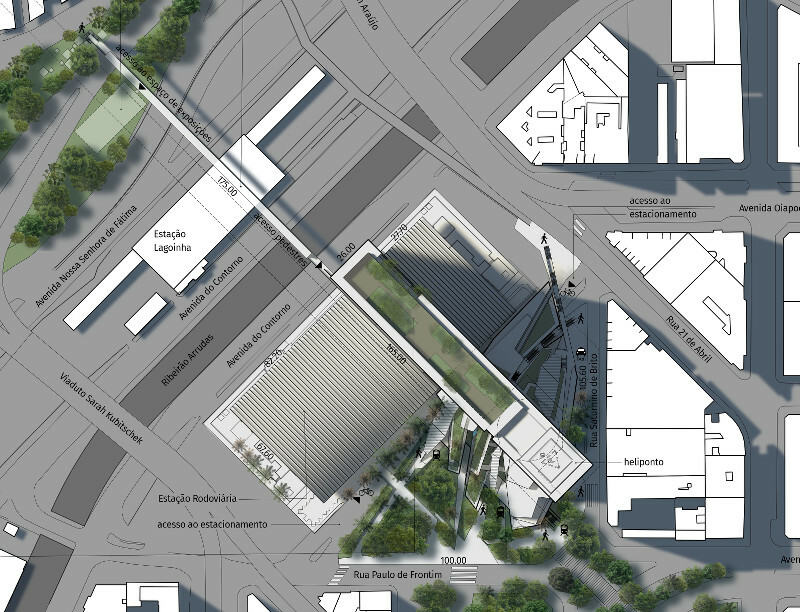 The architectural value of the bus terminal, as well as the other heritage buildings around, is gains visibility from the contrast with the other parts, and its impact in the city is raised because of the prominent position it keeps in this proposal. 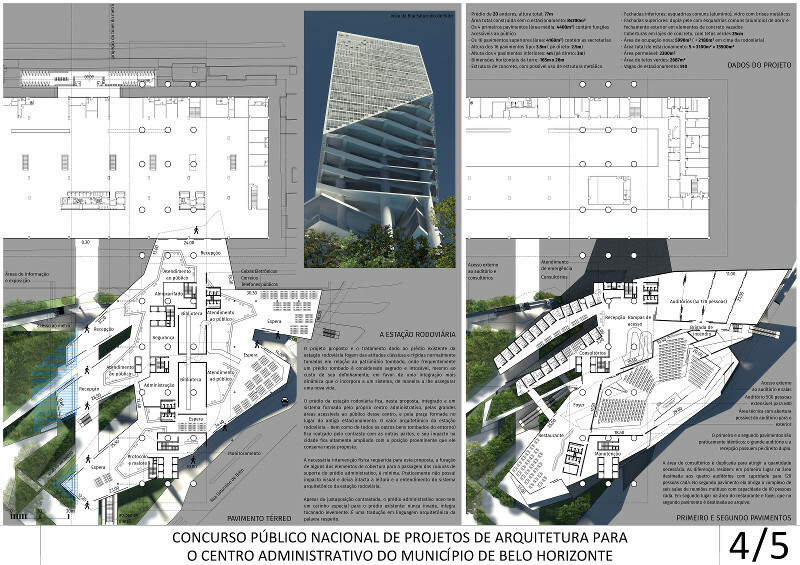 The necessary physical intervention needed by this proposal, the drilling of some of the elements of the roof to permit the passage of the support columns of the administrative centre, is minimal. It has almost no visual impact and leaves intact the reading and understanding of the architectural system of the bus terminal. Even with this contrasted juxtaposition, the new administrative building shows a special care for the existing building: it never invades it, it rather integrates it by touching it lightly. It is a translation in architectural language of the word respect. 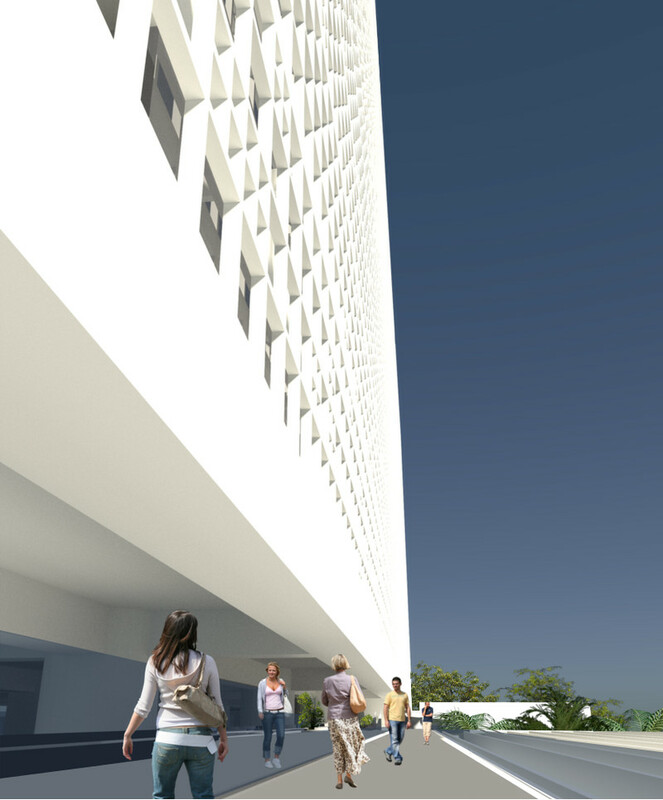 One of the main focus points of this proposal is the broad public access to the premises. Even if most of the program is private, this projects tries to widely expand the offer of interesting and quality public space at this point of the city. 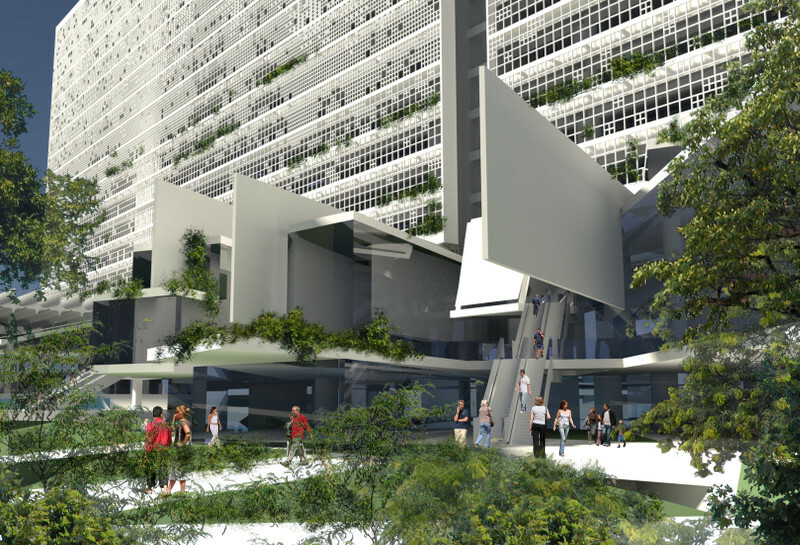 Apart from the existing access to the bus terminal, the general public also earns accesses to the main square, on the current parking lot, which provides further access to the rest of the project: the ground floor, which houses the reception and services to the citizen, and the "hanging gardens" formed by the green roofs above the inferior floors (1 to 4). Some specific functions of the building, like the auditorium, can also be accessed directly from the outside, when necessary, using the many stairs and escalators that cross the gardens. The upper roof deck of the building provides a sky garden, a sightseeing point over the Lagoinha neighbourhood and the northern part of the city. It is also accessible by the public, via a dedicated panoramic elevator. 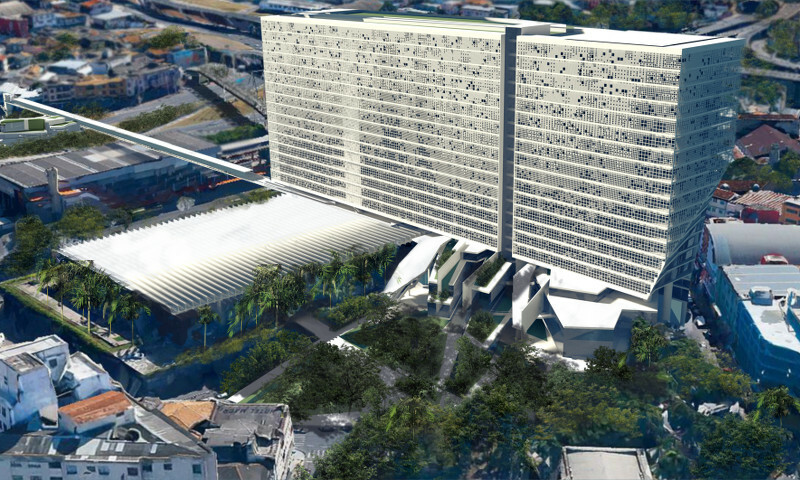 The footbridge that binds the administrative centre to the Praça do Peixe and the exhibitions space, crossing above the roof of the bus terminal, provides the unique experience to discover an architectural heritage building from an unnatural and impressive point of view. 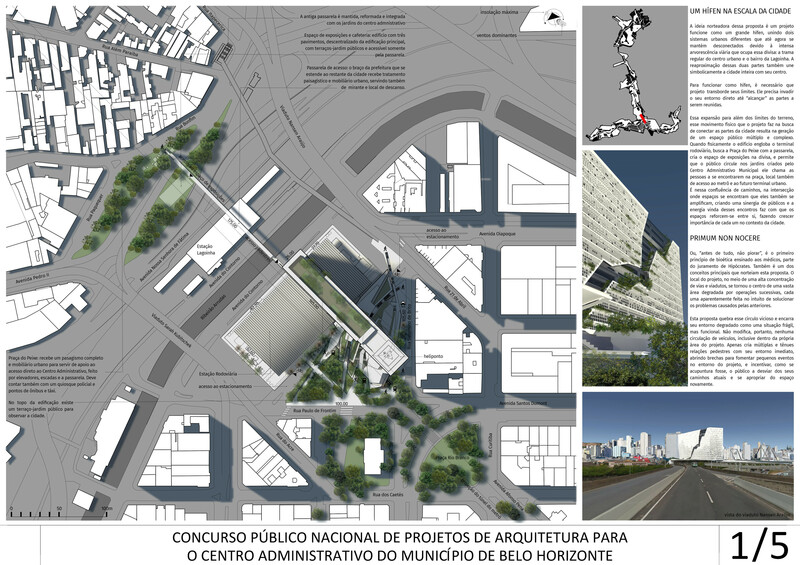 This proposal also tries to create more links between the city inhabitants and the location of the project, with new pedestrian paths, inserted below the viaducts, connecting islands and blocks in a big network that spreads from the smaller squares and enlargements that already exist in the surroundings of the project. Also check the blender model or the FreeCAD model if you want a closer look!